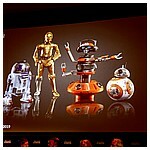 Hasbro started off by showcasing its exclusives from Celebration. Originally revealed at Toy Fair, the Episode I Obi-Wan and Darth Maul on throwback cards were received to much delight and judging from the lines at Celebration they are a hot commodity. The Obi-Wan features two alternative hands and a soft hair braid. We will see him in the summer the Black Series wave. Darth Maul features photo-real face rendering and will be available widely in the fall archive release. These exclusives will also be available at London Comic Con in October and an unannounced Germany convention. Later in 2019, Hasbro will be unveiling a new lightsaber line. People will be able to train on an app based system featuring five masters of the force including Rey, Darth Vader, Yoda, Kylo Ren, and Luke Skywalker. You can monitor your own training or challenge a friend to a dual. First an acknowledge of the fan poll winner, Luke Skywalker Dagobah. The next wave will be this summer. Some notes after seeing the packaged images: 0-0-0 has alternative hands featuring murder hands and BT-1 has alternative side panels. These will be up for presale tomorrow on Pulse. Also summer 2019, Walgreens will have the exclusive Clone Commander Obi-Wan Kenobi. This was the first time we saw official images of the newest wave. These will also be available this summer and up for preorder on Pulse tomorrow. We also got a look at the skiff guard pack. These will be in one pack but on individuals cardbacks. Fun fact, the Vedian cardback required Hasbro to digitally remove Lando's hand from the image and digitally recreate the hand. 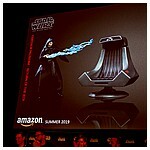 Although it was leaked on some other sites, Hasbro showed us official images of the Amazon exclusive Emperor Palpatine. He will included alternate hands and three alternate hands. This should also be up for preorder tomorrow. Hasbro next showed us a series of Galaxy's Edge exclusives coming this spring. A previously leaked Kylo Ren, Commander Pyre, Mountain Trooper, and MSE Droid pack was great to see in the official reveal. Also shown the droid pack featuring R2-D2, C-3PO (with moveable elbow joints and proper-sized thighs), BB-8 with a new weathering, and DJ R3X. Lastly we saw a hero pack featuring Rey Jedi Training with photo-real paint, Chewbacca, Porgs with new deco, and Hondo (from Rebels and Clone Wars) with a new costume. We will get some six inch and 3.75 inch at SDCC this year. Lots of Kenner love in store. First a Protoype Colors Darth Vader based off his Kenner mold on a Kenner cardback with a pop art graphic. 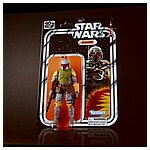 Next up, Boba Fett six inch with classic Kenner colors. Based on his 1979 deco, he will come on a 40th Anniversary Kenner Style card. 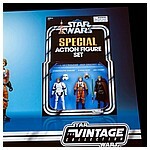 Lastly, a Vintage Collection Luke Skywalker three-pack. Featuring Luke Stormtrooper, Jedi, and X-Wing Pilot. This will come in a Special Action Figure Set pack featuring chrome packaging. All of the exclusives will be available at several other conventions including Fan Expo in Canada, ACG Hong Kong, Comic Con Madrid, London MCM Comic Con, Asia Comic Con Malaysia, and the Unboxing Con In Mexico to name a few. We got a look at the upcoming Luke Skywalker X-Wing Fighter Pilot helmet. It features a fully padded interior, adjustable chin strap and mouth piece, and surround sounds. 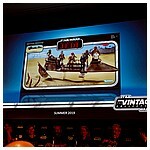 It will feature sounds from the Death Star and Hoth battles. It will also project red and green lights synced with explosion sounds. Few notes on the questions. There is no indication of when the next Haslab announcement will be or what it will be in terms of medium. There are no plans that Hasbro is ready to share regarding the Legends line, upcoming figures from the original trilogy, or potential cantina aliens. Lastly, we got a look a concept prototype lightsaber, which we are referring to the Mistsaber. What looks like a high powered flashlight projecting into a beam of liquid guided mist, essential appears to function like a true lightsaber projecting from the hilt. We saw a functioning prototype but were not allowed to take photos. We also saw a rough test video featuring both a Rey and Kylo Ren lightsaber. In concept they appear pretty cool but we know nothing about the technology, functionality, or cost.